Patricia, Derick, Tun Minn and I enjoy our morning coffee. 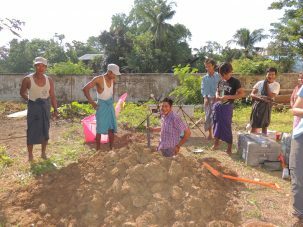 Our hired laborers dig the sensor hole for us in the muddy soil. Mandalay switched from the next morning to that night, Eric thought I’d better go with Patricia, Derick and Tun Minn Oo. He was concerned that drive for the other team might be too long for me to get back in time for my ride. 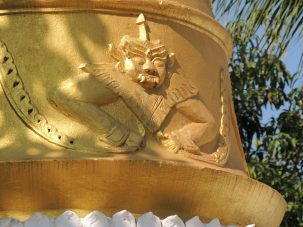 Closeup of one of the gold-covered demons on the side of one of the pagodas. 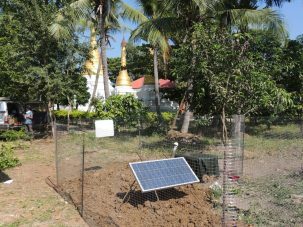 Our laborers carefully covering the tarps over the sensor and under the solar panel with piles of dirt. The finished site with the pagodas in the background. pagodas, and play with the kids and others who had come to watch. 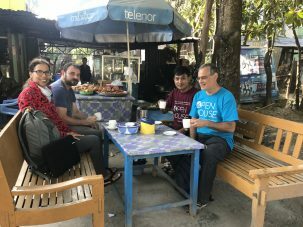 Having snacks and tea with the monk before heading back to Shwebo. last bit of mud was shoveled back and making a neat job of it. 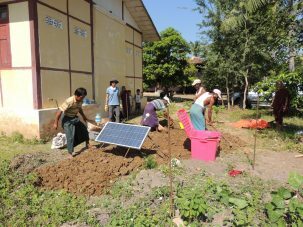 They had a lot of integrity and refused to take more than a ridiculously small payment for the work. When the work was done we took off our shoes and met with the monk. He gave us tea and some snacks to eat at a low table. When I noticed has wasn’t eating I asked him about it. 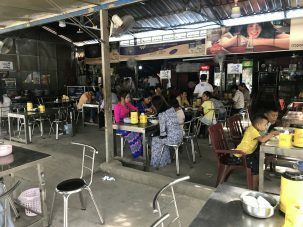 Monks do not eat after noon. It was 12:04. They eat breakfast and a brunch around 11:30, then fast the rest of the day. Monkeys guard the entrance to the Kuthodaw Pagoda. Some of the stupas or caves that hold the pages of the world’s largest book. Mike, Anna and Oo Than was right. One side of one of the 729 stone tablet pages. parliament, the Hluttaw, in 2015. 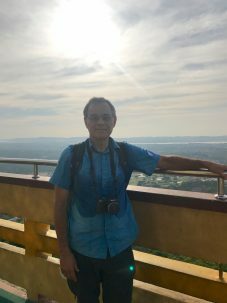 He and Myo Thant, vice chairman of the Myanmar Earthquake Committee, were in Mandalay to lead a university field trip along the Sagaing Fault. 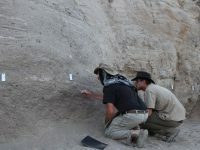 It is a large strike-slip fault, similar to the San Andreas Fault. Here the Irrawaddy River runs along the fault. Soe and I have been trying to meet during this trip, but he was in Yangon when I was in Nay Pyi Taw and now he will be in Nay Pyi Taw while I am in Yangon. Luckily we were able to briefly cross paths in Mandalay. The open air restaurant where I had lunch. 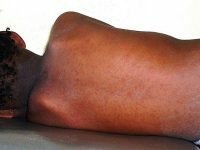 It is similar to many in Myanmar. 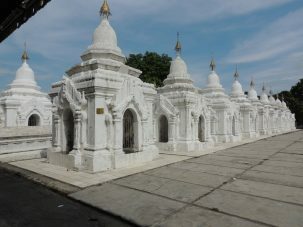 Kuthodaw Pagoda at its base. It houses the world’s largest book. 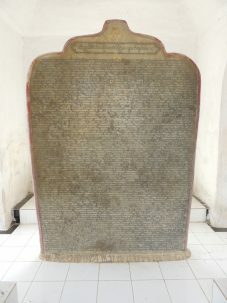 The text is the Tripitaka, the entire Pali Canon of the Theravada branch of Buddhism practiced in Myanmar. It is written on 729 stone tablets (both sides), each housed in a stupa. 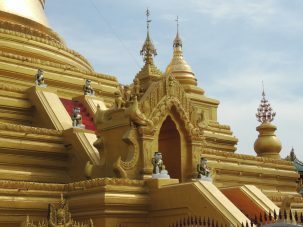 It was built in 1860-1862 by King Mindon after he founded Mandalay as the last royal capital of Burma. The British conquered lower Burma in 1823 and took the rest of Burma in 1885. 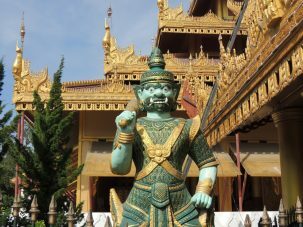 One of the demons guarding the Buddha. 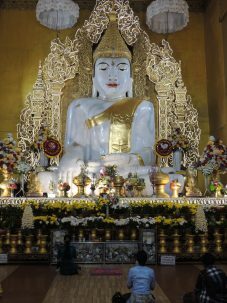 The giant statue of the Buddha carved out of a single block of marble. The people in the front show its size. World War II and replicas are still being built. 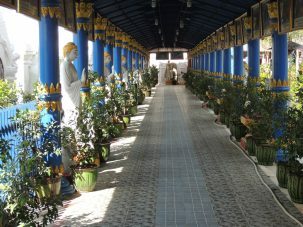 One of the columned walkways lined with statues. to find them. I spent time talking to a number of them, before I walked down with a group of monks and another tourist. We were some of the last to leave. 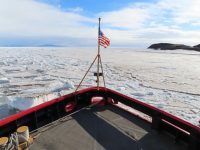 A nice ending for the fieldwork part of this trip. 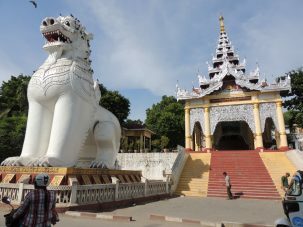 The entrance to the covered stairway up Mandalay Hill is protected by two dragon-lions. hydrocarbon exploration in Myanmar before flying home. It has been a long but satisfying trip. In a few years (with a lot of work), we will have a much better understanding of the structure of this region and its earthquake hazard. 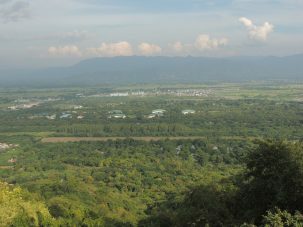 View to the east looking out towards the Shan Plateau. You can see the sweat on me from the climb as I enjoy the view from the top. 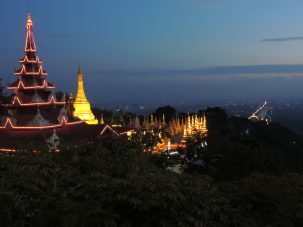 View south of the lighted pagodas and walkway. Part of the moat of the palace is visible in back. 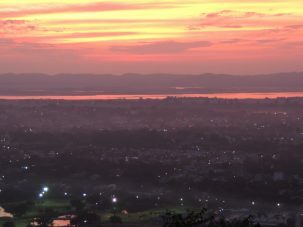 Sunset over the Irrawaddy River with Mingun Hill, formed by the Sagaing Fault behind it. Annual Barnard Senior Seminar Poster Session Monthly overview of IRI's Global Seasonal Climate Forecasts and ENSO status and forecast.